Buick Encore keys do not have to cost a fortune. 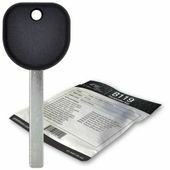 You can order from us the same key at a large discount comparing to your local Buick / GM dealership. You can get your ignition key programmed by a locksmith which will save you even more additional.